/ Visit Nuevo Progresso, Mexico, in Fewer Than Four Minutes! Nuevo Progresso is a small town in Mexico. It’s about 35 miles SE of where we spend the winter in Mission, Texas. It’s commonly called “Progresso,” however Progresso is actually a small Texas town a few miles north of Nuevo (New) Progresso, Mexico. Winter Texan flock to Nuevo Progresso to have dental work done inexpensively and to purchase drugs much less inexpensively than in the United States. We usually bring back a bottle of vanilla and, sometimes, a new leather belt. Leather goods are relatively inexpensive. The quality varies from very good to not-so-much. I’ve spent a lot of time studying this winter. I’ve learned a lot about making video’s, for example. Editing a video can be a very simple task if all one wants is to stick a title on it and release it. In fact, that can be done on YouTube. If you want more extensive editing, it can become complex and very time consuming. I’ve downloaded a free but very capable video editing program called HitFilm 4 Express and am trying to learn how to use it. Because I was in the learning mode, it took a few hours to add the title to this little video. But it moves and fades in and out! Those events don’t happen automatically! Note the picture at the right. If you want Closed Captions to appear, click the white square with the “CC” in it. That icon toggles Closed Captions on and off. 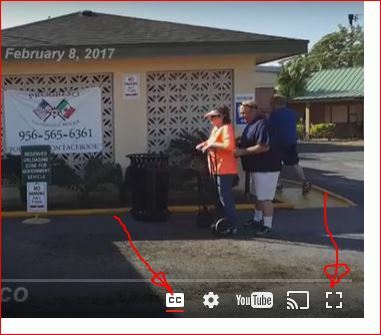 The square at the far right end expands the video picture so it fills the entire screen. To get back to normal screen size, hit the Esc button, usually near the upper left corner of your keyboard. I highly recommend watching this video in full-screen mode! Actually, it looks pretty good and the colors are brilliant! And now, without further explanation, here’s the video. Enjoy!